Direct On The Beach! Beautifully Remodeled. REMODELED AND READY FOR 2018! NEW DECK, PAINT, HVAC, FURNITURE AND MORE. Green Reef Unit 4 is located on Scenic Old Highway 98... is a Gulf-Front, spacious townhouse right on the beach in a upscale area of Destin, Florida (next door to Destiny by the Sea). This will is a Platinum furnished townhouse and luxury at its finest with its private beach frontage and 2 parking spaces. Green Reef Unit 4 is a 2 bedroom/2.5 bath townhome that sleeps up to 8. It has two large living areas with direct gulf views and access each with 2 queen size sofa sleepers. Master bedroom has a king bed and private beach balcony on the beautiful Gulf of Mexico. All new guest room has a queen bed and full bath. All rooms have flat screen TV's with DVD, full access WiFi Broadband, Travertine tiled floors through out the main floor and granite countertops in the kitchen. The unit IS DIRECT on the beach. Relax on one of three beachside decks for a magnificent view of the Gulf of Mexico. Perfect for family fun in the sun and easy access to the beach with the bottom deck stepping down to the water's edge. Entertain with the convenience of an outdoor grill, dinning table, comfortable deck lounging furniture and outdoor night lighting. Located in the heart of Destin, this unit is only moments away from Destin's premier restaurants, nightlife and shopping... your own piece of paradise. This unit has many repeat visitors and books very quickly. See you at the beach! Sorry, no rentals to anyone under 25 years of age. We loved our stay in Green Reef #4. The town home was clean and quaint. Very charming! The view is absolutely amazing, it's right on the beach. It's also very close to amazing restaurants and shopping. We couldn't have asked for a better place to stay and enjoy our time in Destin. The worst part about our stay was having to leave. We will definitely be back! The view alone is reason for the 5 stars! We had a great time- location can the beat! The property was just as described & we will return! We arrived on Saturday & we're under mandatory evacuation on Monday due to hurricane Michael. Although the the stay was shortened the communication prior to our arrival was great, the check in was easy, Chris Allison could not have been nicer & the condo was just as described we will definitely return next year & years to come. Our thoughts & prayers go out to everyone affected by hurricane Michael! Chris was very helpful and available throughout our stay. The property was clean and ready when we arrived. The property was in a phenomenal location and the beach right at our doorstep. The kitchen was great with everything you would need to cook with. The outside decks were great. The property interior was a tad tired but not enough to keep us from coming back. The condo pictures and description are spot on. The proximity to the beach was simply awesome! The decor was very classy and the condo was quite spacious. The views were lovely especially from the master bedroom balcony. Awesome rental! 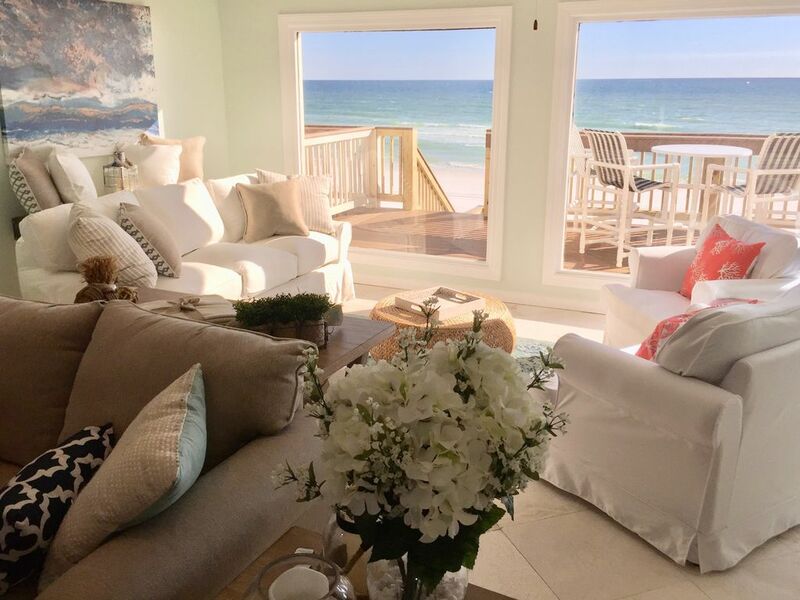 The house is beautiful, the beach is amazing. Chris was great to work with. It was the easiest check in i ever been to. The only negative thing I can say I wish we had an umbrella to sit on the deck, it gets very hot. And the grill Was very rusty. Overall I gave it a five star because everything else was wonderful. Thanks Lisa! We arrived Sunday afternoon and I had no idea the grill was that rusty! I got a new grill and replaced it on Monday. I'm so sorry - if I had realized it was that bad I would have thought someone would have said something earlier. I'll look into an umbrella but the wind makes it really hard to keep one. We are now reserving for 2018! Please note we prefer Sat. to Sat. stays. Requests for these Sat - Sat stays will be considered priority requests for 2018.